Active Citizenship is the idea of a person being involved with their community at all possible levels – locally, nationally and globally. “As someone who is involved with several economic, psychological, social and entrepreneurial causes and works with teams and organizations all over the world, I consider myself to be an active citizen,” Juhi Kore, senior political science major, said. Born and raised in Mumbai, India, Kore said she never felt like she belonged. 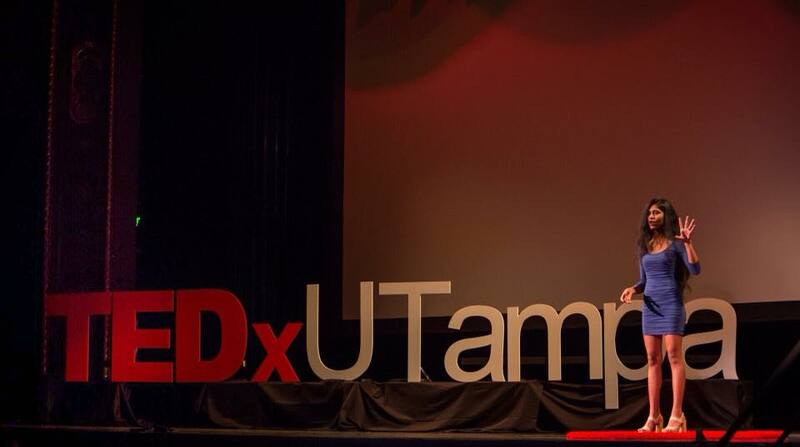 Seeking opportunity, at the age of 17 she came to Tampa and began college at UT to evolve her passion for social entrepreneurship and further her education. Being a social entrepreneur is one way of being an active citizen. Kore talked about this in her talk at Ignite Tampa Bay. They are both related to positively impacting the community and a social entrepreneur will always be an active citizen however an active citizen may or may not be a social entrepreneur. Social Entrepreneurship is the use of start up companies and other entrepreneurs to develop, fund and implement solutions to social, cultural or environmental issues. Kore has also studied at University of Oxford with the Honors Program. Kore said her time at UT has transformed her as an individual and a student. Kore has spoken about social entrepreneurship at several places including: the University of Oxford, the Oxford TownHall, Oxford Orators, University of Tampa, Highrisers Toastmasters, TEDxUTampa, Cambridge Innovation Center in Miami and, most recently, the Innovation Summit in Tampa. She is the person behind the #JuhiApproved brand and the host of the #JuhiApproved Live Show where you can watch Kore talk on live shows, such as TedxTalk at the University of Tampa, and keep up to date with her Facebook posts. The #JuhiApproved brand started as a YouTube series focused on Kore talking about things, people, places, ideas that she would recommend or “approve” of to the public. It is now also a Facebook Live Show where she interviews and highlights social entrepreneurs and their impact in the community. Kore even has a stamp and certificates and some expansion plans for it after graduation. Kore has multiple people who inspire her and one of them is her mentor, Jeff Gigante. Gigante has been instrumental in Kore’s growth as an individual and entrepreneur in the last year. He’s the co-founder of the Ciccio’s Restaurant Group and they own some of Tampa’s most popular restaurants on South Howard Street. Some of her other inspirations include: Randi Zuckerberg, the founder of Facebook live; Rebecca White, distinguished chair of entrepreneurship and director of the entrepreneurship center, from UT’s entrepreneurship center; and Ana Bakshi from the Oxford Foundry in Oxford, England for being empowering women in the world. Kore also looks up to Tampa’s next mayor, Topher Morrison for his incredible speaking abilities and genuine love for Tampa. Kore is an international speaker who delivers world-class talks and presentations on various topics that she is extremely passionate about. Her research work is focused on international relations and urbanism. Kore said she loves to work with people who are passionate, curious and can appreciate her positive attitude and enthusiasm for life. Out of all Kore’s accomplishments, she values studying abroad at the University of Oxford and being selected as the Campus Director for the Hult Prize competition there where she guides students who compete with various business ideas on an international level. Leading up to the event Kore said she was overwhelmed and even considered cancelling the event. However, she knew that would be unfair to every individual that had dedicated their time and energy to make this happen. “It would’ve been inconsistent with my value and motto – Perseverentia et fide en Deo which translates to Perseverance and Faith in God,” Kore said. She kept the event on and it went smoothly and even guided a group of students at Oxford and they went on to the Regional Finals in London and Won at the Regional Finals which she attended in person during Spring Break. “So, helping people accomplish their goals, especially in the social entrepreneurship realm, was my biggest accomplishment thus far,” Kore said. Kore’s love for academia doesn’t end at UT or Oxford. After working for a year or two she plans to go to graduate school to pursue a masters and a PhD and study the big question of how can we make our cities happier. Sarah Cirelli can be reached at sarah.cirelli@spartans.ut.edu.